A growing body of evidence confirms that student skills not directly captured by tests of academic achievement and ability predict a broad range of academic and life outcomes, even when taking into account differences in cognitive skills. [i] Both intra-personal skills (such as the ability to regulate one’s behavior and persevere toward goals) and inter-personal skills (such as the ability to collaborate with others) are key complements to academic achievement in determining students’ success. This evidence, in combination with a new federal requirement that state accountability systems include an additional indicator of school quality or student success not based on test scores, has sparked widespread interest in the possibility of incorporating such “non-cognitive” or “social-emotional” skills into school accountability systems. Easily the most ambitious effort to deploy common measures of non-cognitive skills as part of a performance management system is unfolding in California’s CORE Districts, a consortium of nine school districts that collectively serve over one million students in more than 1,500 schools. [vi] Six of these districts have been operating since 2013 under a waiver from the U.S. Department of Education to implement an accountability system that aims to be both more holistic and more useful for improving practice than they believe is possible based on test scores alone. In addition to student proficiency and growth as measured by state tests, the inputs into CORE’s School Quality Improvement Index (SQII) include such indicators as suspension and expulsion rates, chronic absenteeism, and school culture and climate surveys administered to students, teachers, and parents. The most distinctive feature of the SQII, however, is the plan eventually to incorporate self-report measures of what CORE refers to as students’ social-emotional skills directly into school performance ratings. My CEPR colleagues and I have used data from the 2014-15 field test to perform preliminary analyses of the reliability of students’ survey responses and their validity, when aggregated to the school level, as an indicator of school performance. [vii] With respect to reliability, we first examined the extent to which students’ responses to specific items used to measure the same skill were correlated, as would be expected to be the case if they captured a common underlying construct. Across all students in grades 3-12, we found that three of the four of the scales demonstrated strong internal reliability. The exception was the scale used to measure growth mindset, which had an internal reliability coefficient of 0.7, somewhat below the commonly used benchmark for acceptable reliability of 0.8. 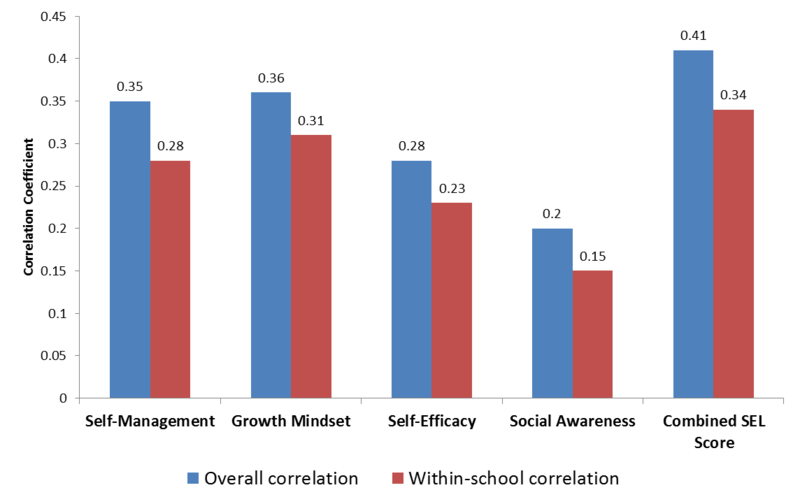 A closer inspection of the data suggested that the reliability of each scale, and in particular the scale measuring growth mindset, was pulled down by lower inter-item correlations among the youngest students completing the survey – those in the third and fourth grades. This may indicate that students below grade five struggled to understand some survey items or are less well-positioned to assess their own skills, and CORE is currently in the process of deciding which grades it will ultimately include. Overall, however, the scales performed well along this dimension, both overall and for important student subgroups such as English language learners and students with disabilities. CORE selected its measures of social-emotional learning based on evidence from other settings that they were valid predictors of academic success. Do those same relationships hold when administered at scale in its districts? Figure 2 shows the correlations between school-average social-emotional skills and key indicators of academic performance (GPA and state test scores) and student behavior (the percentage of students receiving suspensions and average absence rates) across CORE district middle schools. [viii] As expected, social-emotional skills are positively related with the academic indicators and negative correlated with the two indicators of student (mis-)behavior, with the correlations for academic indicators ranging from 0.33 to 0.69. The strongest relationships with academic indicators are observed for self-management, a pattern consistent with other research, while self-management and social awareness are equally important predictors of behavior. 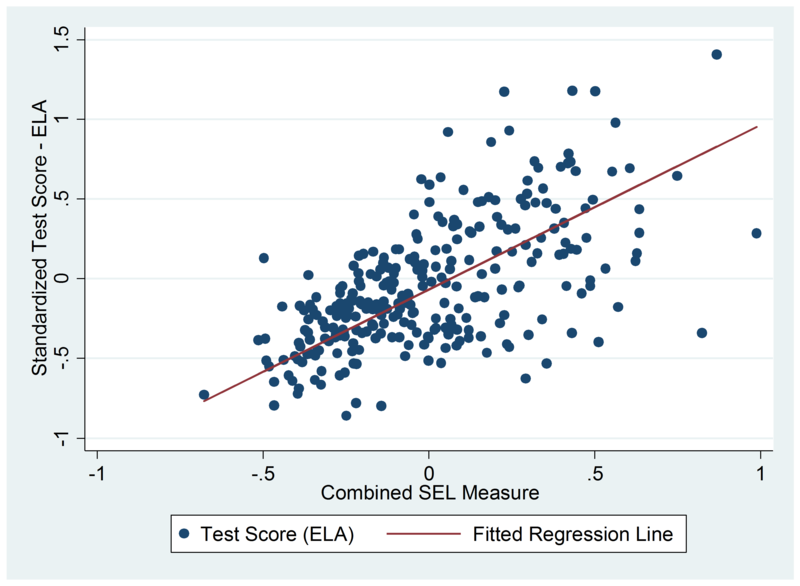 Figure 2 illustrates the strong correlation between CORE’s summary social-emotional learning measure (the average of the four scales) and English language arts (ELA) achievement, but also reveals ample dispersion of schools around the regression line. [ix] In other words, students in some middle schools in which academic performance (as measured by ELA test scores) is high report relatively low social-emotional skills, and vice versa. On one hand, this could reflect authentic variation in performance across academic and social-emotional domains – and therefore the value of a more holistic indicator. On the other, it could be that students in some schools rate their social-emotional skills more critically than in others, perhaps due to variation in norms across schools that leads to reference bias. 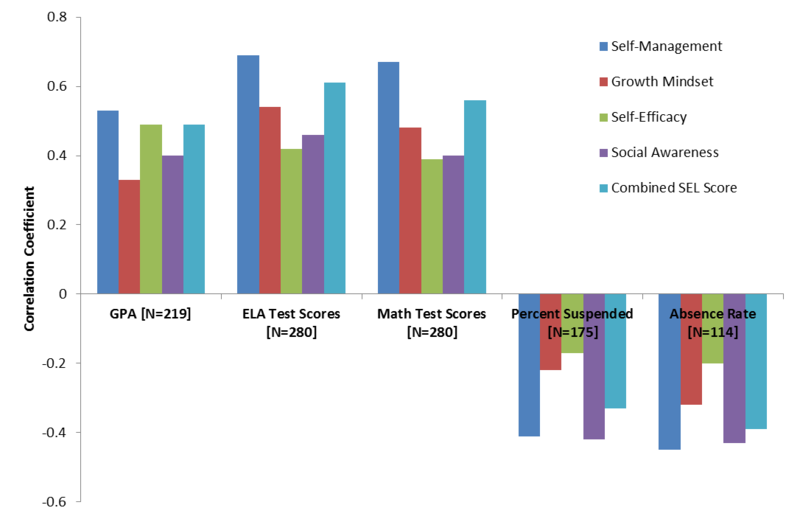 Figure 3 shows the results of this comparison for ELA test scores. [x] It shows that the overall and within-school correlations do differ modestly but that the former are stronger than the latter – precisely the opposite pattern that would result from systematic reference bias due to varying expectations. To be sure, this analysis does not rule out the possibility that reference bias may lead to misleading inferences about specific schools with particularly distinctive environments. It does, however, provide some preliminary evidence that the form of reference bias that would be most problematic in the context of a school accountability system may not be an important phenomenon in the CORE districts as a whole. In sum, our preliminary analysis of the data from CORE’s field test provides a broadly encouraging view of the potential for self-reports of social-emotional skills as an input into its system for evaluating school performance. That said, the view it provides is also quite limited. It says nothing about how self-report measures of social-emotional skills would perform in a high-stakes setting – or even with the very modest weight that will be attached to them this year within CORE. [xi] Nor can we say anything about how CORE’s focus on social-emotional learning will alter teacher practice and, ultimately, student achievement. The results presented above are best thought of as a baseline for future analysis of these issues – and many more.